It’s time to lock up the biscuits and banish the buns as The Tiger Who Came To Tea pounces onto the stage at St George’s Hall, in Bradford next month. The tea-guzzling Tiger, created by Judith Kerr, is given a new lease of life in David Wood’s musical adaptation of the classic picture book. If you’ve ever wondered how to behave when a Tiger drops by for tea this is the perfect explanation. When Sophie and her mummy invite the hungry Tiger in to join them, he proceeds to eat all the sandwiches, buns and biscuits and even manages to drink all the water in the tap! What will Sophie’s Daddy say when he gets home? 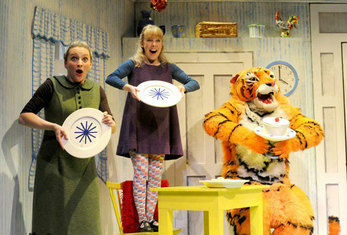 The Tiger Who Came To Tea is a delightful family show, with sing-a-long songs, rhyming and repetition for children ages 3 plus and their families. David Wood OBE, is undisputedly the country’s leading writer and director of plays and musicals for children. His many successes include West End hits The BFG, The Witches and Goodnight Mister Tom the Olivier Award-winner 2013 for Best Entertainment and Family.